If dinosaurs are extinct, then why do they seem to come to life each night? When Alexis' friend, Miss Maria, tries to save her business by importing mechanical dinosaurs to her nature park, Alexis and Kate are instantly on the spot to show their support. But the Camp Club girls are soon embroiled in surprises when they soon have to not only deal with mechanical dinosaurs appearing to have minds of their own, but also the local media, which also seems determined to destroy Miss Maria. Can the girls crack the case and keep Miss Maria's dreams-and business-alive? In Alexis and the Sacramento Surprise by Erica Rodgers, Miss Maria buys mechanical dinosaurs for her park to attract more visitors, but they have moved and left footprints! Alexis and Kate scavenge around and find strange clues from a hole in the fence to fake footprints. Will they figure it out before Miss Maria loses her lifes savings? 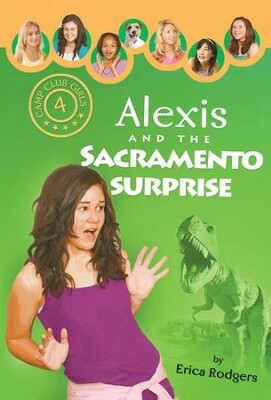 I'm the author/artist and I want to review Alexis and the Sacramento Surprise - eBook.